The iBraille App is a free app created to bring braille and digital literacy together. Through the app, using an iPad and a refreshable braille display, students can practice and hone their braille literacy skills anywhere, anytime! 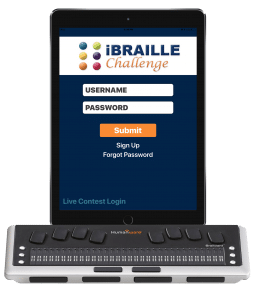 The iBraille Challenge App is based on Braille Institute’s Braille Challenge, a national academic competition in which students in first through 12th grade are tested on fundamental braille literacy skills such as reading comprehension, spelling, speed and accuracy, and proofreading. The App provides students with grade-appropriate practice tests and enables them to exercise their braille skills, receive immediate feedback, and monitor their progress over time.